Posterior fossa tumors commonly present with obstructive hydrocephalus. Cerebrospinal fluid diversion procedures, done in such patients, carry the rare risk of reverse brain herniation, which is associated with significant mortality. 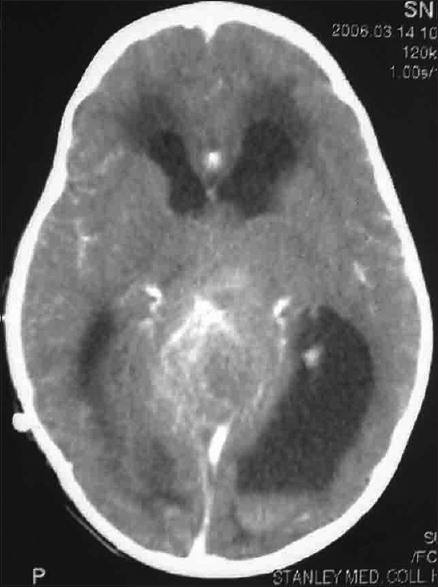 The following case illustrates the need for the prompt diagnosis of reverse coning and immediate interruption of the ventriculoperitoneal shunt for patients who deteriorate after the procedure. The risk of obstructive hydrocephalus in posterior fossa tumors is quite high. Cerebrospinal fluid (CSF) diversion not only improves symptoms such as vomiting but also stabilizes intra cranial contents providing a stable and slack operative field at the time of definite surgery. However, postoperative deterioration in the condition of the patient should alert the surgeon to the possibility of reverse coning of the brain. 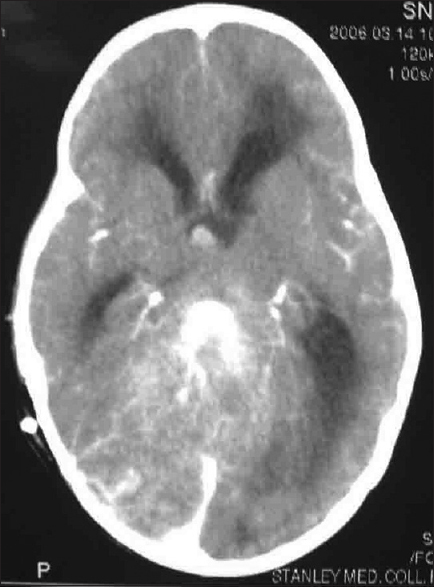 A 3.5-year-old female child presented with altered sensorium, without history of fever or trauma. On examination, the child was drowsy, but arousable and did not obey any oral commands. Pupils were 3.5 mm, sluggishly reacting to light. Fundal examination revealed bilateral papilledema. Bilateral extensor plantar reflexes were elicited. 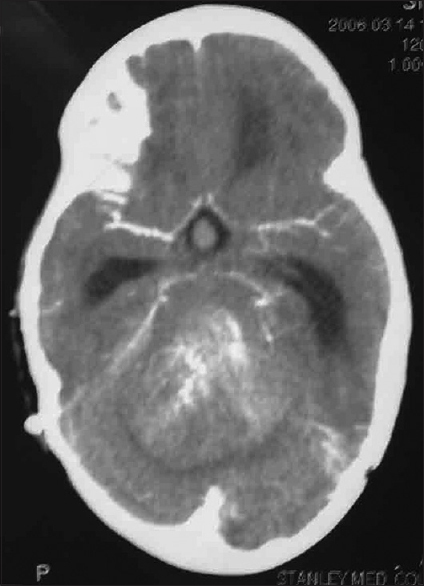 Computed tomography (CT) brain showed a calcified 4th ventricular tumor with obstructive hydrocephalus [Figure 1] and [Figure 2]. 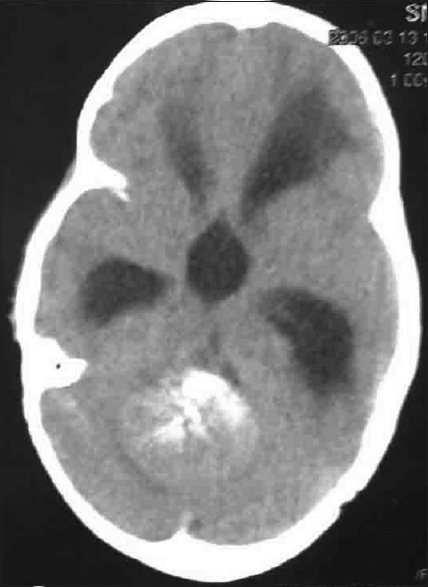 The child underwent emergency right ventriculoperitoneal (VP) shunt. CSF was found to be under high tension. Postoperatively, the patient showed marked clinical improvement. She was awake and responding to simple oral commands. Four hours following the shunt procedure, the patient had a bout of vomiting and became unconscious. On examination, GCS was E1 V1 M2. Pupils were dilated, of size 4.5 mm and not reacting to light. Doll's Eye movement was impaired. Bilateral extensor plantar reflexes were elicited. A clinical diagnosis of reverse (upward) transtentorial herniation was made and CT brain was repeated. 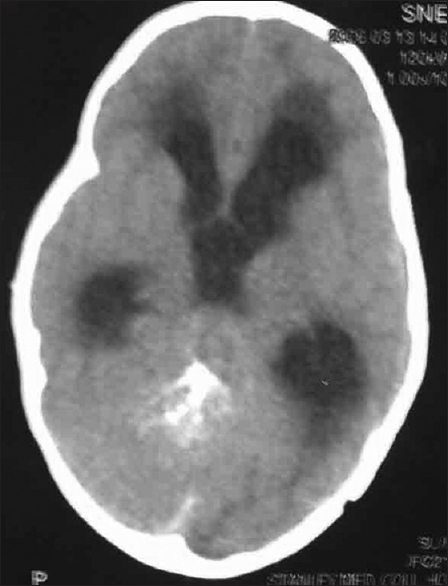 CT brain showed upward herniation of tumor and cerebellum along with compression of posterior third ventricle with pressure effect on the frontal horns of the third ventricle [Figure 3], [Figure 4], [Figure 5]. Frontal horns were dilated initially too but did not show any compression in the preoperative scan. Reverse transtentorial herniation is a complication that has to be kept in mind while shunting patients who have large posterior fossa tumors along with gross hydrocephalus. Allowing a liberal amount of CSF to leak during the surgery or low-pressure VP shunt tubes may lead to reverse coning., Here, intracranial pressure is raised due to blockage of CSF in both the downward direction (at the aqueduct of sylvius) and in the upward direction (at the junction of pontine and ambient cisterns). Further, due to compression of vein of galen and basal vein of rosenthal, ICP is raised. It is a neurosurgical emergency. Emergency posterior fossa craniectomy and tumor decompression must be done. Prognosis is very poor. Even though this condition is documented in literature, images of this condition are not documented, because usually, there is no time to take a CT scan, as the operating team usually rushes the patient for emergency surgery. As no image of reverse coning is available in literature, this image is presented for publication. Ng SK, Mann KS, Yue CP. Surgical management of secondary brain tumours. J Hong Kong Med Assoc 1989;41:58-67. Prabhakar H, Umesh G, Chouhan RS, Bithal PK. Reverse brain herniation during posterior fossa surgery. J Neurosurg Anesthesiol 2003;15:267-9. Ecker A. Upward transtentorial herniation of the brain stem and cerebellum due to tumor of the posterior fossa with special note on tumors of the acoustic nerve. J Neurosurg 1948;5:51-61.